Dubai's main attractions are spread out enough that a practical mode of transportation is an essential part of sightseeing. Roads infrastructure, traffic and transportation in Dubai, including taxis, metro, buses, abras, water taxis and buses are regulated by the Government department called Roads & Transport Authority (RTA). Dubai has an extensive taxi system, by far the most frequently used means of public transport within the Emirate. The public transport system in Dubai depends much more on taxis than is common in other cities around the world, due to an under-developed public transport network. There are both government-operated and private cab companies. The taxis are the same light sandy beige color but have different colored roofs, with one exception. The pink taxis are intended for ladies only (and mothers with small children), and have lady drivers. Rates are the same for all Dubai Taxis, as they are determined by the Roads and Transport Authority Dubai (RTA) - the regulator of taxi services (and other public transport). Some of the private cab companies are Cars Taxi, National Taxi, Cititaxi and Metro Taxi. Most, if not all cab drivers, are expatriates and have lived in the UAE for varying lengths of time. Due to this, cab drivers may have problem with language or getting around the city. Dubai taxi can be ordered via telephone, sms or at the taxi queue at one of the malls or outside a hotel. Waving down a taxi on the road is possible, but can be difficult during rush hours. At peak times (7-9AM & 4-7PM workdays, and Friday evenings) it may be difficult to find a taxi or drivers may demand crazy off-meter fares or refuse short rides in congested areas entirely. 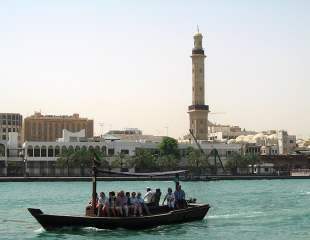 An easier way of crossing the Dubai Creek is by abra, a small traditional ferry. Abra stations are located along the Creek on both the Bur Dubai and Deira sides. The cross-river trip costs 1 Dirham (AED 1) per passenger, payable to the driver after the boat has left the station, and affords a very picturesque view of the city. Abras set off very regularly, and the service is available round-the-clock. Abras can also be hired for a private tour (for a price negotiable with the driver but usually very cheap). This is quite a popular activity at sunset on a clear day, particularly if the driver is able to enliven the tour with stories about the structures on either side of the Creek. Water taxis can transport up to 11 passengers and are equipped with ramp access, LCD screens, air-conditioned cabins and other luxuries. Unlike water buses and abras, they can leave the creek and navigate the waters of the gulf. They run from 10am to 10pm for fares from AED 50 (for a ride across the creek) to AED 570. Passengers have to book rides with the water taxi in advance by calling RTA or via their hotel service staff. For those who are staying in Dubai for more than a long weekend or plan to do a few day trips around UAE, car rental is well worth it and relatively cheap. Cars are available from car rental companies for visitors who have an international driving licence. Some agencies will hire out cars complete with drivers and some international car rentals and local companies offer great deals to expats who want to rent a car. Traffic congestion can be a problem during peak hours of traffic, therefore it is wise to plan trips outside of morning and afternoon rush hours. Driving in the UAE is on the right-hand side. The metro operates both above ground and below ground with RTA feeder buses ferrying passengers to metro stations to provide a cheap and efficient public transport system for Dubai residents and visitors. Dubai Metro Red Line runs from Rashidiya to Jebel Ali, past Dubai Airport (stations at both T1 and T3), to Union Square interchange in Deira, under Dubai Creek to the Burjuman Center in Bur Dubai, then along Sheikh Zayed road above ground. Dubai Metro Green Line runs from Al Ghusais in Deira to Al Ras then under Dubai Creek to the Burjuman Center and continues above ground through Dubai Healthcare City to Al Jadaf. In addition, a 5 km monorail system shuttles passengers across the Palm Jumeirah to the Atlantis hotel, but it's not connected to the metro network and is thus of very limited utility. Trains run from 6am to 11pm, Saturday to Thursday and from 2pm to midnight on Fridays. Each train has dedicated compartment for ladies and children only, but ladies can also travel in other compartments on the train. As part of its new unified fare collection system for all modes of transports the regulator RTA has introduced Nol Card � unified automated fare collection card. There are four categories of Nol Cards � Gold, Silver, Red and Blue, each has been designed for a specific type of public transport user. Cards have an epurse, which allows you to pay-as-you-go, all you have to do is load the epurse with money and use it, and it will automatically calculate the cost of your trip and deduct it from your e-purse. Cards can be used on all modes of transport, and they are valid for 5 years, therefore they are ideal for a frequent traveller sor those who wish to travel across different modes of transport using a single card. A NOL Card can be purchased for only AED 20 and can be topped up to a maximum of AED 500. Beside by cards, metro transport can be paid by tickets. Ticket has to be pre-loaded with the correct trip type, and when you use your ticket, 1 trip will be deducted. Tickets can be loaded with up to 10 trips. Tickets can only be used on a single mode of transport at a time (e.g. Bus only, Metro only), and they are valid for 90 days. Tickets are ideal for visitors and occasional travellers. Tickets cannot be purchased on train, but must be purchased before travel and are available from ticket offices, dedicated outlets and ticket vending machines. Fares for the Dubai Metro range from a minimum Dh1.8 to a maximum Dh6.5 for a single journey, depending on the distance covered. The passengers will be able to use public buses and the metro with the same fare to complete their journey. Public buses are clean and cheap, but unfortunately not very comprehensive and (on some routes) quite infrequent. The bus system is most useful for getting between different areas of central Dubai, or between the various suburbs, rather than general transport. Nol card or ticket are used for fare payment and cards could be purchased from most bus stations, metro stations, and sometimes from the bus driver. The main bus stations are Gold Souq Market (in Deira) and Al Ghubaiba bus station (in Bur Dubai). The bus fleet is made of top quality custom-built buses that are equipped with individual seats, air-conditioning, electronically operated destination display system, and computerized fare equipment system. In order to make waiting for the bus more comfortable for commuters, Dubai has established air-conditioned bus stops. As Dubai is divided into 5 zones, fares range from AED 1.80 to AED 6.50 for one journey, depending on the destination. Clear route maps and time-tables are placed inside a few bus stands. The front seats are reserved for women. The Waterbus is an advanced Abra service offering further comfort and luxury to commuters. The Water Bus began its service on Dubai Creek from July 2007. There are four different routes for commuters, and the fare is paid by cash or NoI card. Book your Cheap Flights to Dubai for your Dubai vacation.